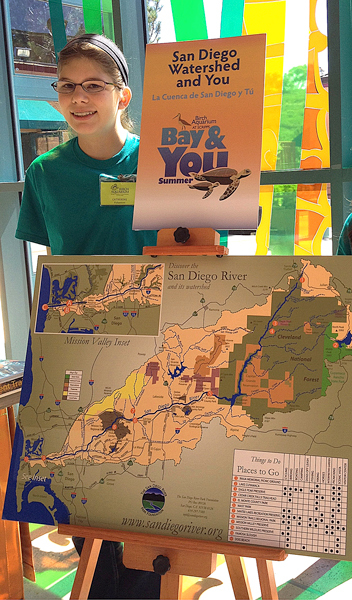 Birch Aquarium at Scripps Intern Catherine Harmeier teaches visitors about the watershed and San Diego Bay. Summer is a wonderful time of year to relax and catch up with old friends. It’s also a time to learn new things and meet plenty of new people. This summer we’re participating in Birch Aquarium at Scripps’ Youth Summer Internship, getting hands-on experience while learning about aquatic creatures and marine environments. This internship is so fun because we all share a passion for the ocean and want to share it with our visitors. You can usually find us interacting with guests at activity stations in the main Galleria or on the Tide-Pool Plaza. 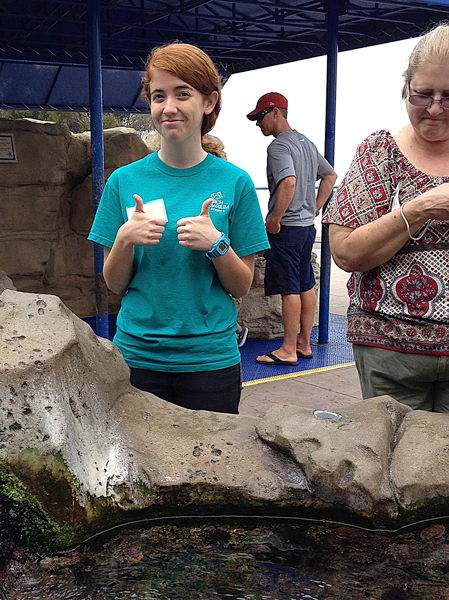 It’s thumbs up for Birch Aquarium summer intern Briana Scott while working on the Tide-Pool Plaza. Our focus this year is on San Diego Bay. We’ve learned so much about the Bay and have been able to share it with our visitors. One of our favorite activity station is about the sea turtle. Most visitors have no idea that 60-70 Pacific green turtles live in San Diego Bay. It’s really fun to answer their questions and listen to their stories. Working on the Tide-Pool Plaza is also a favorite place to spend our time because we get to interact with both people and animals. Our sea stars and sea cucumbers work just as hard as volunteers do to help people learn about ocean life. This internship has really helped some of us develop social skills and become more comfortable with people. We’ve also discovered ways to teach people that goes beyond the classroom setting. For example, kids like it when we make jokes or tell them interesting facts. They laugh when we say the sea cucumber is resting on the sea lettuce because they are trying to make a salad. It sounds pretty silly, but it helps younger children become more comfortable and encourages them to try touching the different animals. All of us interns agree: If you’re interested in sea life and can’t wait to explore it, apply for this wonderful internship. We hope to sea you soon!